Onivyde (irinotecan) in combination with fluorouracil and leucovorin, is an approved medicine by the U.S. Food and Drug Administration(FDA). It is used to treat patients with advanced (metastatic) pancreatic cancer. Previously they were treated with gemcitabine-based chemotherapy. At an early stage, pancreatic cancer can be difficult to diagnose. In addition to this, treatment options become limited, especially when the disease has spread to other parts of the body and to remove the tumor is not possible. The main function of pancreas is to help in digesting food and regulating several other bodily functions through the hormones that it secretes. If cells in the pancreas multiply out of control and form a mass, pancreatic cancer is there. These cancer cells can invade other parts of the body. Adenocarcinoma is the most common type of pancreatic cancer. Pancreatic cancer arises mostly after 70 years of age and chances of survival are very low. The effectiveness of Onivyde was demonstrated in 417 patients with metastatic pancreatic adenocarcinoma. In these patients, cancer had actually grown after receiving the a gemcitabine-based therapy. As a result of this study, it is determined that the patients who were treated with Onivyde plus fluorouracil/leucovorin lived an average of 6.1 months, almost two months more than the other patients. In addition to this improvement, Onivyde plus fluorouracil/leucovorin had delayed the tumor growth in the patients. Here you can find important information about possible side effects of Onivyde (Irinotecan), recommended Dosage and its cost. When it comes to safety, like most chemotherapeutic drugs, Onivyde, comes with many side effects. After clinical trials, the reported side effects diarrhea, vomiting, nausea, fatigue, decreased appetite, inflammation in the mouth also called stomatitis and fever. Lymphopenia and Neutropenia were also found as side effects. There are risk of potentially life-threatening neutropenia and severe diarrhea, also mentioned in the labeling of Onivyde. In addition, Onivyde may cause severe hypersensitivity reactions including anaphylactic reactions. Onivyde was also found to result in low counts of infection-fighting cells. Pregnant woman should be careful if they are being treated with Onivyde, as it can cause fetal harm. They are usually advised to have effective contraception at all times during treatment as well as one month after the final dose. Males should use effective contraception at all times during treatment and four months after final dose, those who have female partners with reproductive potential. Breastfeeding is strictly prohibited at any time during treatment as well as one month after the final dose. The recommended dose of ONIVYDE is 70 mg/m2 administered by intravenous infusion over 90 minutes every 2 weeks. While recommended starting dose of ONIVYDE in patients known to be homozygous for the UGT1A1*28 allele is 50 mg/m2 administered by intravenous infusion over 90 minutes. Later, the dose of ONIVYDE should be increased to 70 mg/m2 as tolerated in subsequent cycles. For patients with serum bilirubin above the upper limit of normal, there is no recommended dose. Premedication Administer a corticosteroid and an anti-emetic 30 minutes prior to infusion of ONIVYDE. For management of overdosage of ONIVYDE, not a single treatment interventions known to be effective. In case of grade 3 or 4 adverse reactions, it is recommended to withhold dose or per your doctor’s instructions.It is important to follow the instruction strictly. The patients who experience a severe hypersensitivity reaction and in patients with a confirmed diagnosis of interstitial lung disease, ONIVYDE should be discontinued. 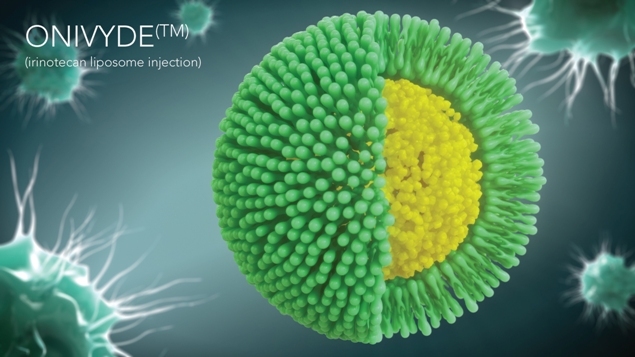 ONIVYDE is going to replace Gemcitabine drug therapy as it showed in a phase 3 trial that it could achieve efficacy in the patients who didn’t respond to gemcitabine drug therapy. An important thing about ONIVYDE is that it is not a single therapy drug. That’s why company has already combines it with two other drugs known as F-5U and leucovorin in order to give an extra boost in efficacy. ONIVYDE has declared as orphan drug in the US, EU and elsewhere. With an orphan drug designation, a medicine enjoys certain incentives such as tax credits, user fee waivers, and eligibility for orphan drug exclusivity to assist and encourage the development of drugs for rare diseases. It is expected that ONIVYDE will be priced between $5,000-$10,000 per course.